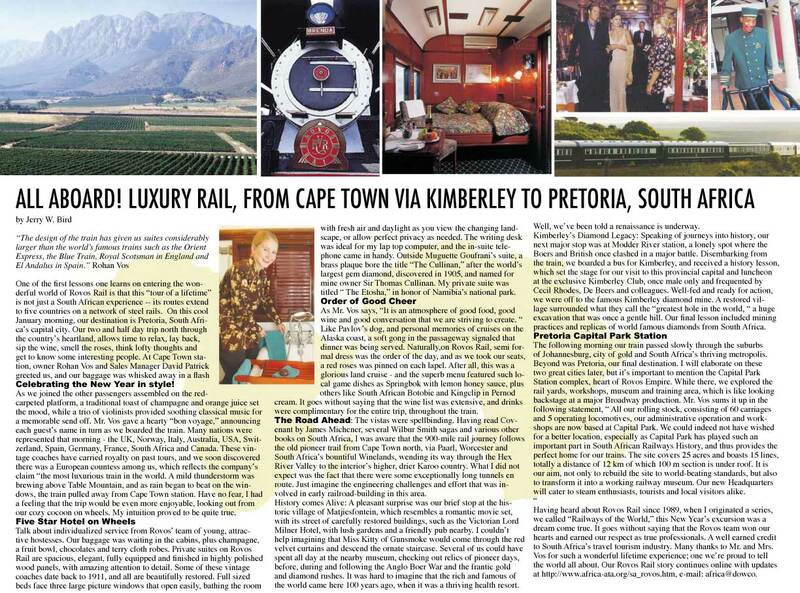 Railways -AFRICA TRAVEL MAGAZINE. MARKETING AFRICA IN PRINT! ONLINE! ON AIR! A 13-day journey offering an amazing and comprehensive view of South Africa, incorporating virtually every internationally-regarded 'must see' sight and highlight. As the train travels the length and breadth of the country, guests can enjoy the great variety of landscapes, shorelines, cultures, lifestyles and cuisine that the South African Rainbow Nation has to offer. There are many varied options included within this tour, so please contact us for a full itinerary. The start point is Cape Town, with tours of the interesting sites of this fabulous city. From here the train will then traverse through the country to the vineyard region of Overburg with its history of Hugenots, and fabulous Cape Dutch houses. Passing whaling stations and the coast, we continue to Kimberley, the home of the De Beers diamond mines, and so on to Bloemfontein. After a tour around this interesting town, we rejoin the train to travel overnight to Ladysmith. The train now heads to the eastern jagged peaks of the Drakensberg, following waterways as they drop and cascade down mountain clefts, through hidden valleys to the tumbling luscious hills that extend through the Midlands. Here there are visits to Boer war battlefields, lush forests, and a shopping experience of an eclectic and fascinating mix of arts and crafts as well as world-class restaurants. Overnight travel takes guests to Durban, to experience the vibrance of South Africa's third largest city. Its beautiful long beaches are enhanced by the sub-tropical climate. Hindu, Sufi and Muslim temples provide a mix of interests. You will see the Juma Musjid, the largest mosque in South Africa, whose twin minarets are a striking city feature, as well as the most opulent Hindu structure. Whilst the train travels to Zululand, guests have time to study the life of the Zulu warrior before visiting a Zulu cultural village. Our train carries on to the tiny kingdom of Swaziland, where off-board excursions include a visit to Manzini where guests experience the Swazi market, a hive of activity displaying a wide variety of skillfully crafted woodcarvings, colourful textiles and superb basketwork, for which Swazis are renowned. There are trips to museums, glass works, and a drive through the Komati River Valley with its panoramic views. By day 11 the train arrives at Kruger National Park, where one can either visit the park or take one of the many options available: visit a gold mining area, hot air balloon flight, safari, to name a few. The penultimate day sees guests visiting many sites in Pretoria, Johannesburg and Soweto, before bidding farewell to their journey on the Shongololo Express. Shongololo Express train safaris traverse eight countries in Africa on four different routes through South Africa, Namibia, Botswana, Mozambique, Zimbabwe, Zambia, Swaziland and Tanzania. Passengers on board the train travel comfortably during the night, waking up each morning at a new destination. Shongololo Express train safaris are a unique concept and operate like a �cruise ship on land�; there is no daily packing or unpacking of luggage required. During the day guests are taken on a variety of excursions by professional multi-lingual guides (French, German, English and Afrikaans), on air-conditioned Mercedes Benz Sprinter buses that are carried on board the train. The tour itinerary changes daily, with a variety of excursions from which guests can choose and which fall into the categories of Highlights, Wildlife & Eco Tourism, Culture and History. All excursions, including the guides, entrance fees and transport are included in the tour price. In addition, there are many optional extra activities on offer such as game drives on open air vehicles, elephant back riding, hot air ballooning and break away overnights in private game lodges. The tour price also includes a full English & continental breakfast and a four course dinner. The evening set menus include many elements of the African cuisine of the countries which we visit. The only items not included in our tariffs are clients� lunches, drinks, laundry, gratuities, optional extras, break away options and other expenses of a personal nature. Shongololo Express has been in operation for fifteen years and continues to provide its guests with a warm welcome and friendly atmosphere on board the train. Our guests, many of whom come back again and again, make new friends and take away life time memories from their grand African adventures. As originator of a travel series called Railways of the World, going to Casablanca, Morocco's largest city, by rail was a wonderful way to start off the week and celebrate the new year. We enjoyed the journey so completely that the route from Marrakech (3 hours) seemed far too short. However, as we soon learned from the staff on board, visitors can travel between many of Morocco's principal cities by rail. That includes the Northern port of Tangier, a few miles from Spain with its famous Talgo Train service. We were on our way to visit Benachir Akli of Olive Branch tours who worked with ATA on the last two great events hosted by Morocco National tourism Board. As our friend will agree, Rail Travel is still one of the most practical, inexpensive and relaxing of all modes on transportation, and this route to Casablanca was a shining example of price plus convenience. We traveled in a modern, first class coach, enjoying the privacy of a 6-seat compartment all to ourselves, with ample overhead storage for luggage and carry-ons. The one way tickets purchased at the counter without reservations were less than $15 in U.S. currency.